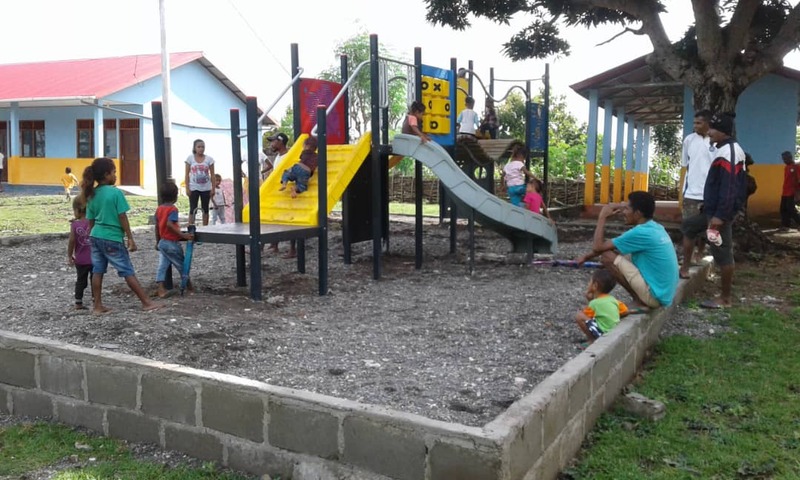 Ricardo Krauskopf from the Rotary Club of Port Melbourne has written to tell us that Belola Primary School and Kindergarten, Balibo Suco, Bobonaro District, Timor Leste is 100% completed! Understandably, there have been great celebrations. President Donna has written to the team of D9940 Rotary Clubs who helped to make this project happen - Plimmerton, Porirua, Tawa , Wellington North, Palmerston North and Ngamotu. She has offered heartfelt thanks for the contribution all these Rotary clubs have made and says she admires the way they recognised a need and saw where we could offer support. Donna says, 'What a huge Rotary achievement! What I like most is the partnership with the community, from the land to the blessings, to the diggings and building and finally to education. What a story for Peace and Resilience on such a traumatic piece of land in the name of the Balibo 5 journalists and the villagers who lost their lives'. 'Please take a bow! The Belola School is finished and 120 children started their new school year in their own school on 1 February. The old school was burnt down in 1999, during the Indonesia withdrawal from East Timor. That was 20 years ago and thanks to your donations, now a new school is about to open! The school consists of three classrooms, an office, a kitchen and five toilets, including water and sewerage. The team worked very efficiently and delivered the school, in time and on budget. $ 18,000 - total fit-out costs, including desks, chairs, sporting equipment and first years consumables such as exercise books, biros, pencils, rulers. Also includes shipping, port cost and transport to Belola. Commercial and Job Creation Initiatives. Restoration of the 350-year-old Balibo Portuguese Fort and redevelopment of it into a small 4-Star Hotel. Construction of a Community Kitchen and a Mechanic’s Shop, both also used for vocational training. These initiatives attract tourism and volunteers to the Balibo area, increasing commercial activity in farming and retail. They have also created more than 40 full-time jobs across hospitality, teaching, nursing and dental-care. City of Geelong, Omnitech Playgrounds, Sparrows Early Learning [Childcare Centres] Advantage Kitchens, Stoney Creek Trust, Rotary’s ‘Donations in Kind’ and the Rotary Clubs of Port Melbourne, Keilor, Melbourne South, Flemington, Pakenham, Berwick, Bentleigh-Moorabbin, Windsor [NSW] and the Rotary clubs of Plimmerton, Porirua, Tawa, Palmerston North, North Wellington and Ngamotu [NZ]. This is a wonderful story of courage, commitment, and perseverance and there is every reason to celebrate an exciting future ahead. But the beginning was a different story as this history shows. Belola is a remote village located approximately 15 kilometres from the Indonesian border within the Balibo Sub-District. Children in this small impoverished community are disadvantaged because they are denied full access to education. They have limited access to schools due to distance and lack of transportation. 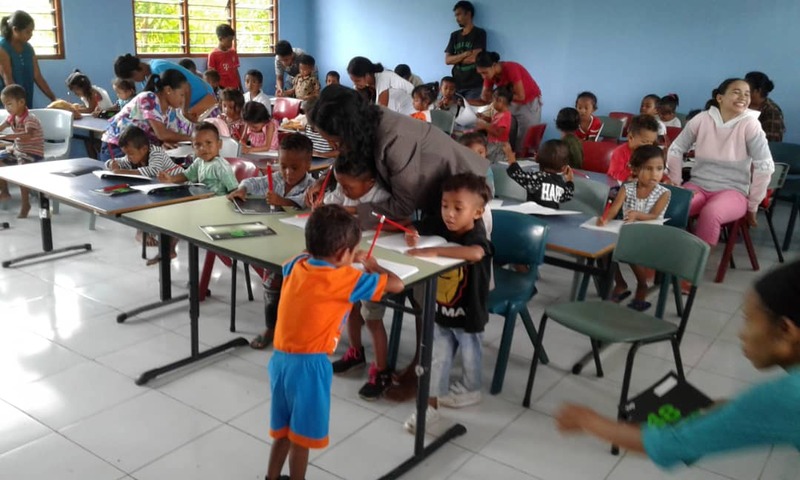 Currently, there is no preschool education within the area and education at the Primary school level requires walking long distances in extreme weather conditions. Here are some of the interviews that were conducted before the Belola Primary School and Kindergarten became a reality. The first interview was with a Katuas (a prominent village elder). His name is Claudino Martins, his age is unknown and he lives in Belola Aldeia. 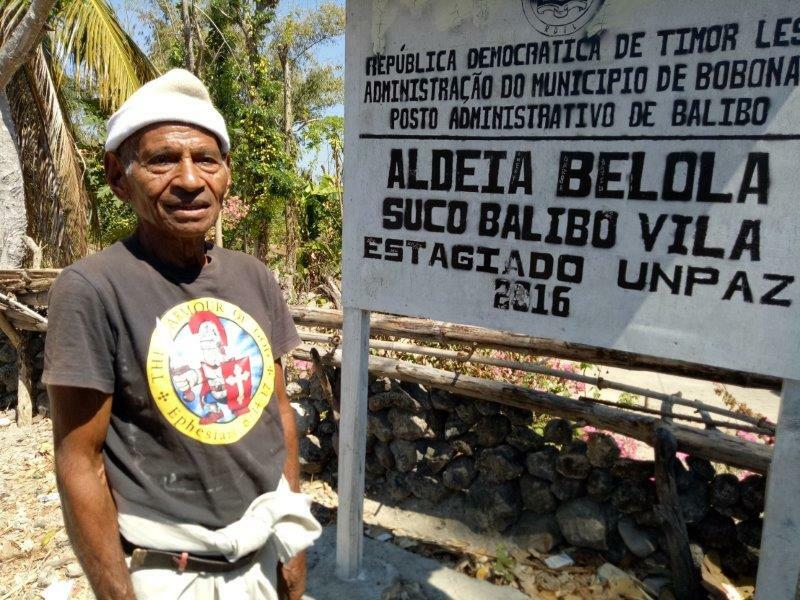 Senor Claudino is a respected Elder and has resided in Belola all of his life. 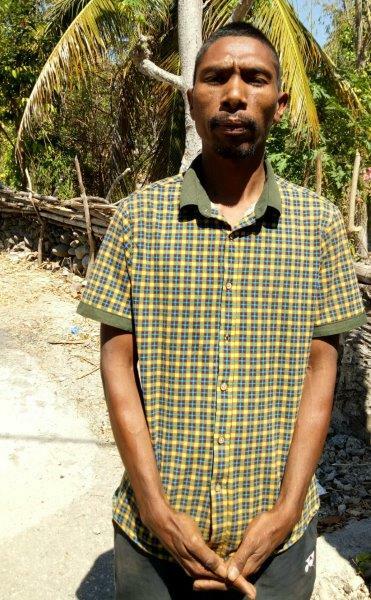 He has been a vocal advocator of educating the children in his community for more than a decade. Interviewer: Sr. Martins, could you tell me a bit about the history of the site where the proposed construction for a school for young children is to be built? 'Originally the site was used as a Primary School and during Indonesian Occupation we had more than 200 children enrolled. After the Independence Referendum was held and Indonesia accepted the result for independence, the Militia rampaged through our village, destroying most of our buildings (Scorched Earth Operation) and burnt the school. I have been trying to get the school rebuilt since 2004. 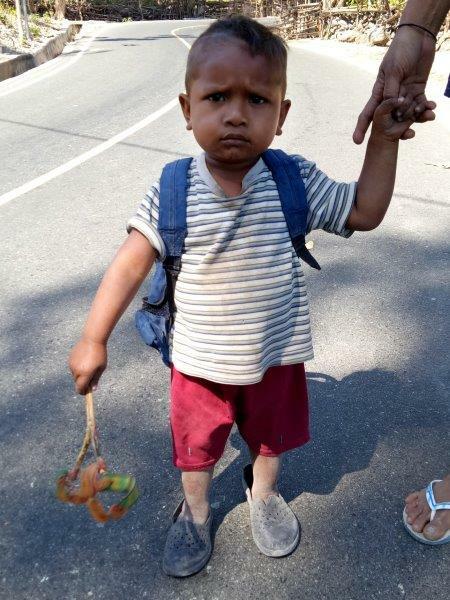 We have so many of our young children in Belola not attending school. I want a bright future for our children. Education will help to stop the poverty. I have four children and didn’t want them to be uneducated like me. Now my eldest son works for the Ministry of Justice, my other son is in the Police Force and my two daughters are nurses. It is important for children to receive an education. I want to thank the people in Australia that are trying to help us rebuild our school and pray that those in Australia will be able to help us'. The second interview was with Chefe Aldeia. The position of Chefe is an elected position. The last election was held in October 2016 and the next election is scheduled in 2021. His name is Marito Sanches Humberto and he lives in Belola. Interviewer: Chefe, could you please tell us a little bit about yourself? If you are married, have any children? Yes, I am married and have four children. The second child is 7 years old and in Grade 2 but goes to school in another Suco. She lives with my brother and his family and the school is close by so it is easy for her to walk to school. My eldest child is 10 years old and in Grade 4. She goes to school but walks a long way to attend. I worry about her walking to school as it is on a main road. In the dry season it is very hot and in the wet season, she is often sick as she walks so far in the rain. Her bag and books get damaged in the rain too. There is no TK (kindergarten) in Belola so my third child does not go to school. My youngest child is too young to go to school. Interviewer: Chefe, we heard from Sr. Martins how the original school building was destroyed, could you please tell us why do think it is important for a school to be rebuilt in Belola? 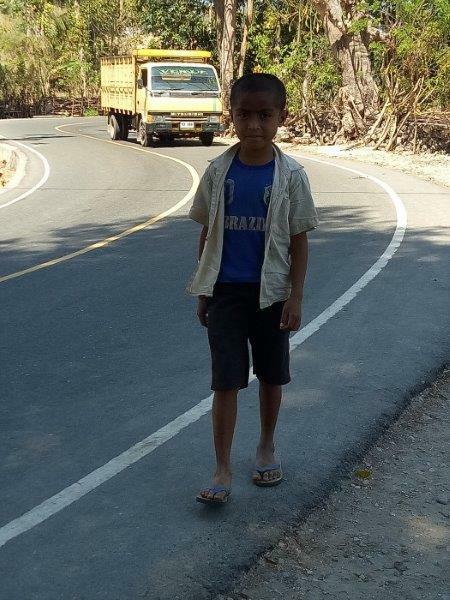 There are too many children in Belola who do not go to school because it is too far away. The closest school does not have any water so the children need to bring 5 litres of water with them to school for sanitation (toilet) and drinking purposes. As most of the parents need to work on the land we cannot bring our children to school. So many children in my community work in agriculture or in the household because trying to get to school is so difficult. If there was a school close by this would make it easier. I have started a register of those parents wanting their younger children to go to school. We already have 68 children registered from Belola with others yet to register. There is no TK for our area. There are many wanting to register their children for TK from not only Belola but from the hamlets Builecun, Aiasa and Boro. There are at least 100-150 children expected to register. Education is very important. I want the best for my children but I also want them to keep safe and healthy. With no kindergarten or Primary School close by it is too difficult for the younger children to attend. This is why it is necessary for the school to be built. The third interview was with a child attending school. Her name is Claudia Solita Deti Pina. 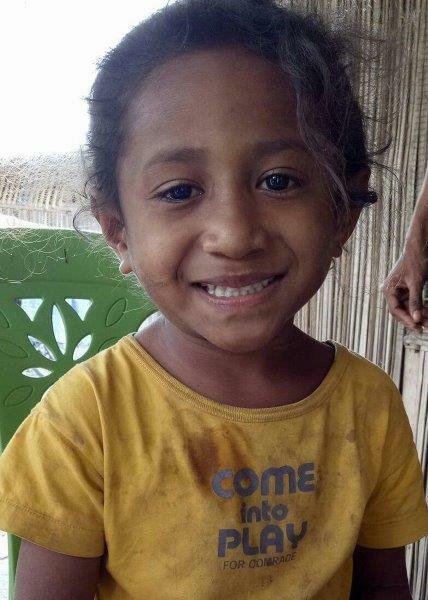 She is 5-years-old and lives in Belola. Interviewer: Botarde Deti, thank you so much for speaking to me today. Can you tell me a little bit about yourself – do you live with your mother and father, what work do they do, do you have any brothers and sisters? I live with my father and mother. My father is an Ojek (runs a motorcycle taxi service) and my mother stays at home and looks after my sisters. I have 2 younger sisters but no brothers. Interviewer: Do you go to school? Yes, I am in Grade 1 at school. Interviewer: How do you travel to school? Sometimes my father takes me in the morning on his motorbike or I walk with my friends but I always walk home with my friends. It takes about an hour to walk. There is a short cut but that is through bushes and I am scared to go that way so I walk on the road because it is safer. Interviewer: Do you like walking to school? It is really hard. In the morning I have to carry water every day to fill the toilet. I like it when my father brings me on the bike because the water is so heavy. When I come home it is in the middle of the day and it is really hot and I get thirsty. Interviewer: What do you like most about school? At school I have many friends to play with and we get to practise singing. I like to go to school so I can learn. Interviewer: If a school was built in Belola, would you like to go to this school? Yes, I would be very happy to be closer to my house. It would be so easy for me. I won’t have to carry water or walk a long way in the hot sun. I would have more friends to play with from my hamlet. Then my sister can come to school with me. Interviewer: Carmo, thank you so much for your time. Can you tell me a little bit about yourself – do you live with your mother and father, what work do they do, do you have any brothers and sisters? I live with both my mother and father who both work in agriculture at home. They sell their vegetables at the markets. I have one brother and four sisters. My eldest sister is in Junior High school in Balibo. Interviewer: Where do you go to school Carmo? my feet were always hurting. Maybe I am too lazy. Now I usually spend the day with other children in the Aldeia or I help my parents. Interviewer: Do you miss school? Sometimes I miss my friends but there are many children to play with during the day. I am also busy helping with household chores, looking after my younger sister or in the garden. Interviewer: Do you think a school in Belola is a good idea? Maybe more children would go to school if there was one close by. It would easy for my little sister to go to school as she is too small to walk so far. The fifth interview was with a mother of four children. Her name is Ernestina Bete Asa. She lives in Belola. Interviewer: Thank you Senora for taking the time to speak with us today. Could you please tell us a little bit about yourself? If you are married, have any children? I am married with 4 children. I have 2 girls and 2 boys. My youngest boy is 4 years old. I work in agriculture and sell my produce locally. Interviewer: Do all your children attend school? My youngest son cannot attend because there is no kindergarten close by. 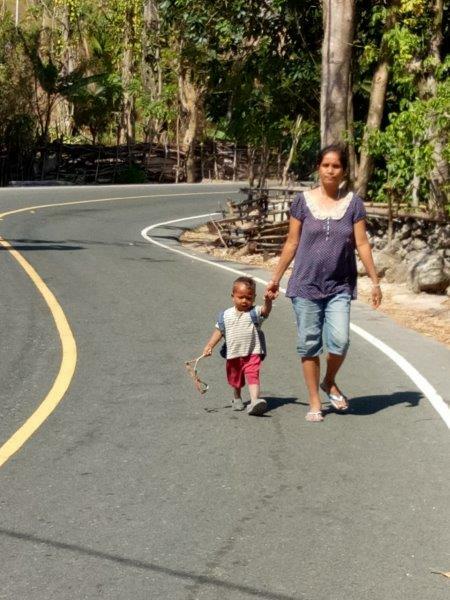 There are two kindergartens in Balibo but this is too far for my little boy to walk. It would take me more than three and a half hours to bring him to kindergarten and pick him up every day (a 20km daily trip). I need to work so I do not have the time. I will wait until he is old enough to walk on his own. There is too much traffic on the road and I would be scared if he walked that distance without me. Kindergarten finishes at 12.00pm and this is the hottest part of the day. He is too young so I keep him at home with me. Interviewer: Do you think it is important for children to attend school? It is very important. I want my children to have a good life. I want them to have a good future. My children need to go to school to have the best future. I only went to Primary School and I don’t want my children to be like me. Interviewer: Would you like to have a school and TK in Belola? Why? My son is missing out on an education because we have no Kindergarten. My other children have to carry water to bring to school, the walk is so far in the hot sun and they come home very tired. Then they need to help with the household jobs (cooking etc.). When it is the wet season my children often miss out on school because they are ill. The road becomes dangerous as there are accidents with cars and motorbikes travelling too fast. I am afraid for my children so some days they do not go to school. We have to replace school books because they get damaged in the rain but sometimes we cannot afford to do this. 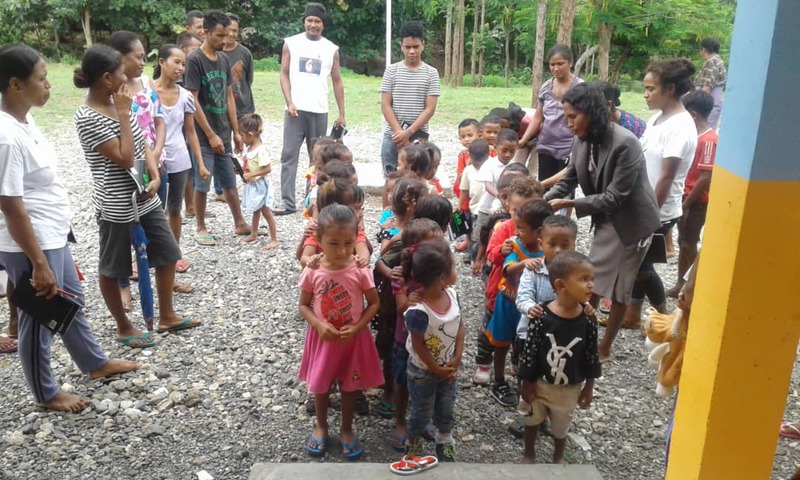 Our children need their education and it would make things very easy if there was a school once again in Belola, especially if the children are under 8 years old. My son would be able to attend Kindergarten and so would many other children in the area. Original generation time 1.4568 seconds. Cache Loaded in: 0.0006 seconds.